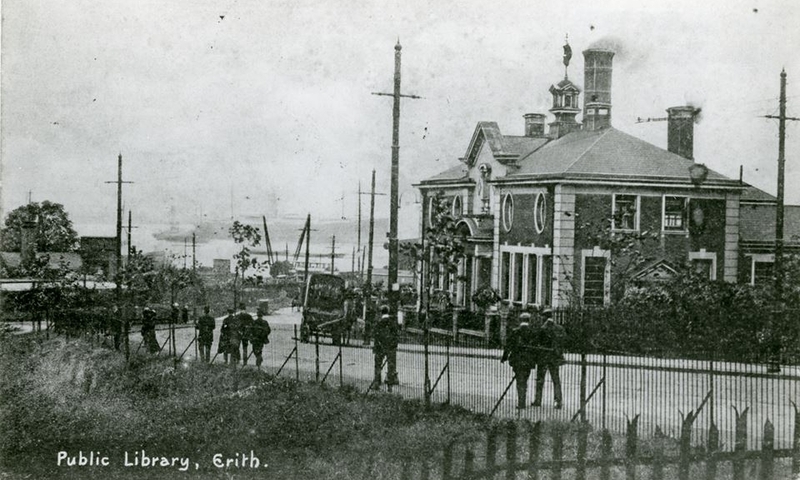 In 1906, the Thames-side industrial town of Erith opened its Library, the first in the town and borough, which was free to use by local workingmen and their families. An impressive gateway to Erith; a fine example of free Renaissance library architecture brick built with stone dressings, with an arched door canopy carried on Doric columns, oval upper-floor iron-framed windows and crowned with a bronze weathervane in the form of a sailing ship. 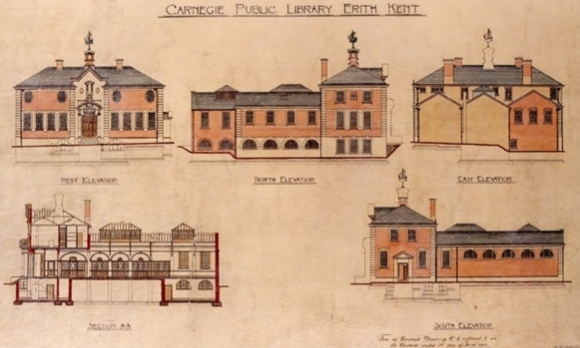 Its construction, and the adoption of the Public Libraries Act, was made possible with the receipt of £7,000 from Scottish philanthropist Andrew Carnegie. 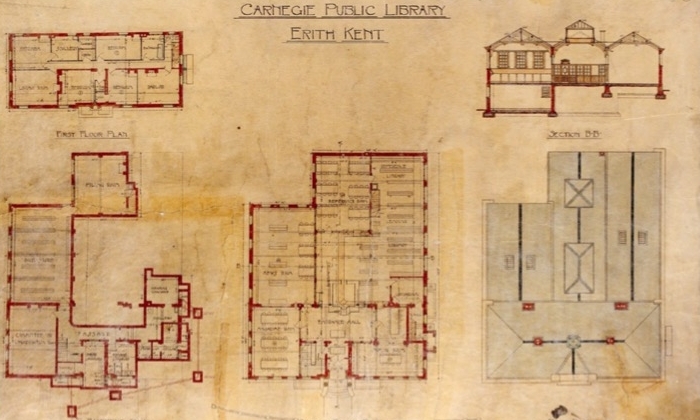 Carnegie believed that libraries were instruments for social change; temples of learning, aspiration and ambition. 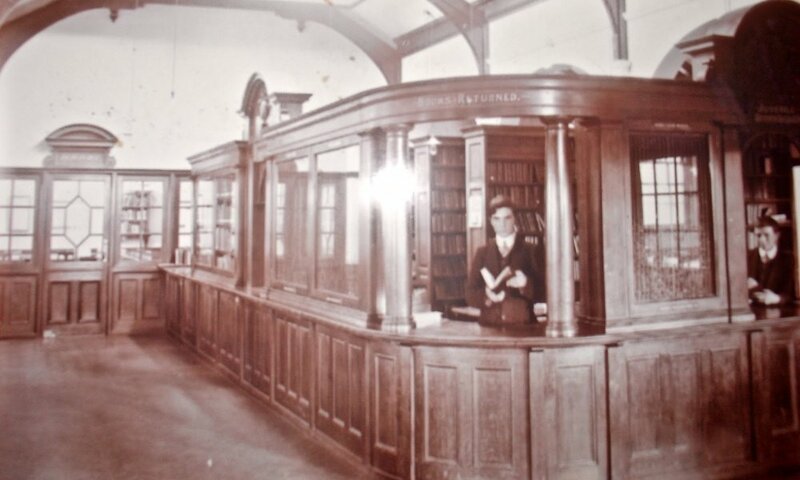 Between 1883 and 1929, a total of 2,509 libraries were built using the patron's funds. Most of these libraries were unique as local communities chose the style and often used local tradespeople to carry out the work. Erith Library was no exception – local architect William Egerton (of Queens Road) designed a building incorporating bricks made locally, and utilising the skills of local craftspeople including builders F. Spencer & Son (of Riverdale Road) and the Thames Steam Saw Mills (a forge on West Street). The architecture is simple and formal, welcoming users to enter through a prominent doorway via a staircase that symbolised a person’s elevation by learning; the lamppost positioned outside, a symbol of enlightenment. Inside at ground floor level, space was given to a ‘News Room’, ‘Reference Library’, ‘Lending Library’, ‘Magazine Room’ and Room for ‘juniors’. Down the “ample Stone Staircase” with its decorative iron railings, there was a ‘Conversation Room’, ‘Book Store’ – originally used for lectures and debates while the book collection grew, and ‘Filing Room’ for staff use. 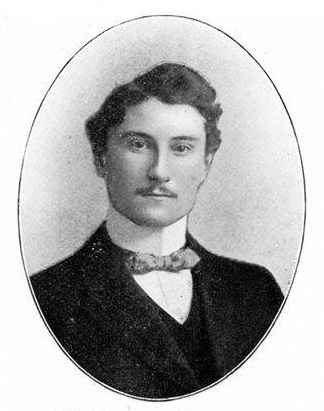 The new Librarian – the “energetic and go-ahead fellow” William Barton Young – resided on the upper floor. Much of this original arrangement has been altered or removed, including the main interior feature – the grand “ornamental oak counter screen” that dominates many of the early photographs. Original interior features that remain include “Erith’s newly granted Coat of Arms” – a mosaic positioned at the threshold to the building which would later inspire artist Gary Drostle’s Fish Roundabout; the book hoist that transported volumes from lower to ground floor; the marble pillars in the main central space; and the aquamarine/white opalite tiled toilets. The site for Erith’s Library was chosen for its proximity to the railway and accessibility to “all parts of the District by means of tramways”. In 1906, The Municipal Journal wrote: “outwardly the library is a gain architecturally... whilst the opportunities which it will offer in the way of education and wholesome recreation will be a handsome addition to the social wealth of the town”. At this point, Erith was a thriving part of the district – a centre for industry and commerce – that attracted people for work and recreation. The new library was to provide further opportunity to the district’s residents through learning. The collection of books grew, and the diversity of the lectures/debates – ranging from ‘Nature’s Masterpiece: The Living Eye’ to ‘Cosmopolitanism’ – was admired and well-attended. Views from early library users were not collected, but the value of the space can be seen by growing numbers of book borrowers and the respect given to Librarian William Barton Young in local press cuttings. Barton Young and his assistant Willmore would both be killed in WW1 with heart-felt memorials given by the community (plaques to both still hang in the building). People also talk of it being a place to come to keep warm in the winter, allowing you to catch up with the news or read the latest Enid Blyton in comfort, away from the noise of industry. Over this period people also report the changes to the interior – the Edwardian oak furnishings were taken out, and the library was given a much more “open and airy” modern feel.